This intermediate course will help you to develop the skills necessary to safely run advanced whitewater. This is not an all encompassing course--someone cannot go from being comfortable on class III to comfortable on class IV from a two day course. 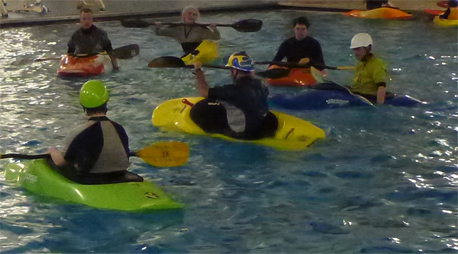 We will focus on teaching drills and techniques that will help you take your paddling to the next level. Please come ready to work and have fun. Day 1, Sunday afternoon: Taking your skills to the next level requires work and we’re going to give you tools to help you help yourself. We’ll start off with a series of warm up drills that will get your blood moving and help you practice your strokes, body/boat awareness, and edging. These drills come from an intersection of slalom, freestyle, and creeking techniques. After the warm up drills we’ll focus on strokes and techniques including a video session. You’ll get to see how you are doing and will get advice from the group. Solid strokes help you to avoid difficult situations, but sometimes those situations can’t be avoided. We’ll continue with a series of fun drills that incorporate rolling. We’ll tailor based upon how the class is doing. We’ll wrap up the pool session with a discussion of how to apply some of the drills and techniques in moving water. We’ll also talk about gear and cover some of the qualities of gear you need to consider as you step up your game. Day 2, Weekday evening: The second day of this two day course will be on moving water. It is optional, but you must have participated in the pool session to join us on the river. Exact location and time TBD based upon river levels - the group will decide during the pool session. Our goal is to practice advanced moves in class II/III whitewater. We are going to make easier sections of whitewater more challenging and more fun by applying what we learned in the pool to moving water. We’ll augment basics like eddy turns and peelouts with body position and momentum and ratchet things up from there. What we’ll do depends upon the current river level and conditions (options include ferrying onto a wave, microboofs, rolling in various conditions). We’ll take a break and discuss as a group was has worked for us and where we’ve had some difficulties. Then we’ll put together some of the moves we’ve practiced into a course. We’ll take turns running the course and giving each other advice. Our goal is to give you the skills to make up your own training routines in the future. You’ll also develop your skills in effectively critiquing yourself and others. You will never look at class II/III the same way again. Before taking this class you’ll want to be comfortable practicing your roll repeatedly and paddling class II/III whitewater. It will be a bit chilly in the early season water, so a drysuit is highly recommended. Participants should have their own equipment (boat, paddle, spray skirt, helmet, PFD, etc.). Cost: $90 course fee plus $10 pool admission for each pool session. Group A: April 14 from 1:00 - 3:00 pm at Meyer Pool & April 17 5:30-7:30 TBD. Register now for Group A. Locations: Meyer's Pool, 7900 Carr Dr, Arvada, CO 80005 & TBD River Location. The river location, date and time is tentative upon river levels. Your instructor will confirm details preceding the 2nd outing.